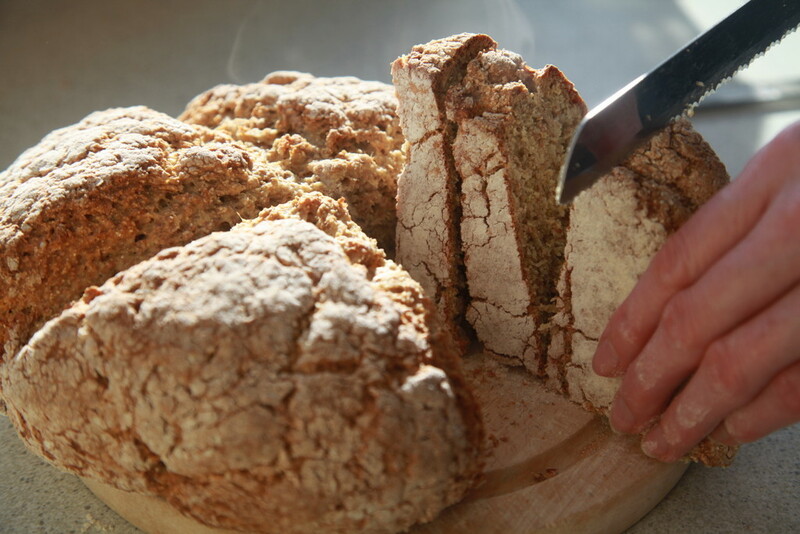 Soda Bread is made in a few countries other than Ireland but it remains quintessentially Irish. So I decided to learn how to make it. Never refuse an invitation is one of my rules here in Ireland so when Trish from Lahinch offered to show me I jumped at the opportunity. 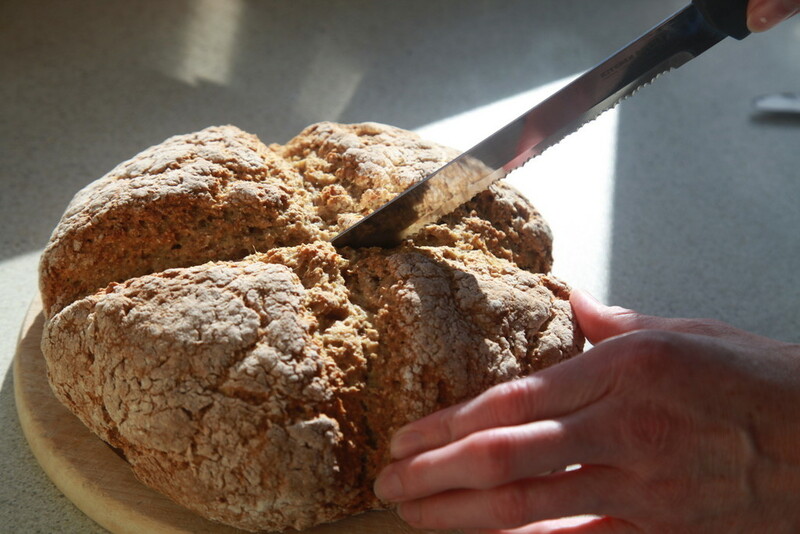 What is Soda Bread? 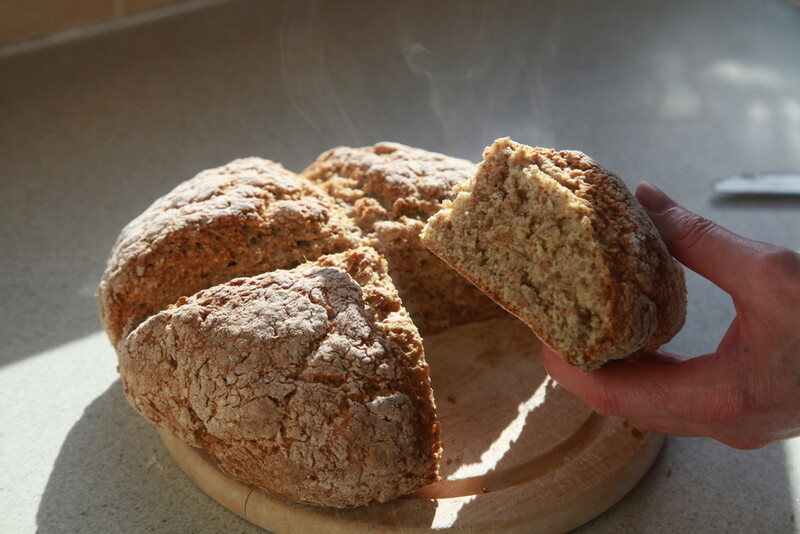 It is a simple quick bread that uses sodium bicarbonate (what the Irish call ’bread soda’) as the leavening agent instead of yeast. 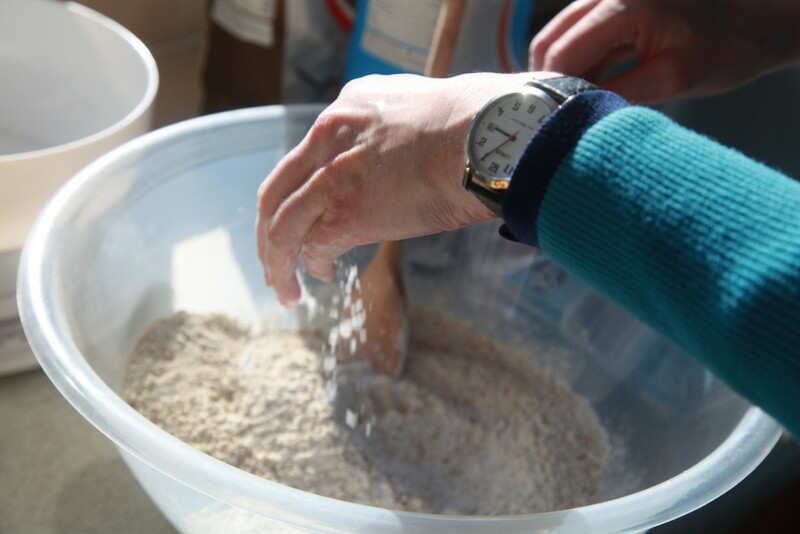 It relies on mixing buttermilk (weak acid) with the soda (alkaline) to produce tiny carbon dioxide bubbles which cause the bread to rise. 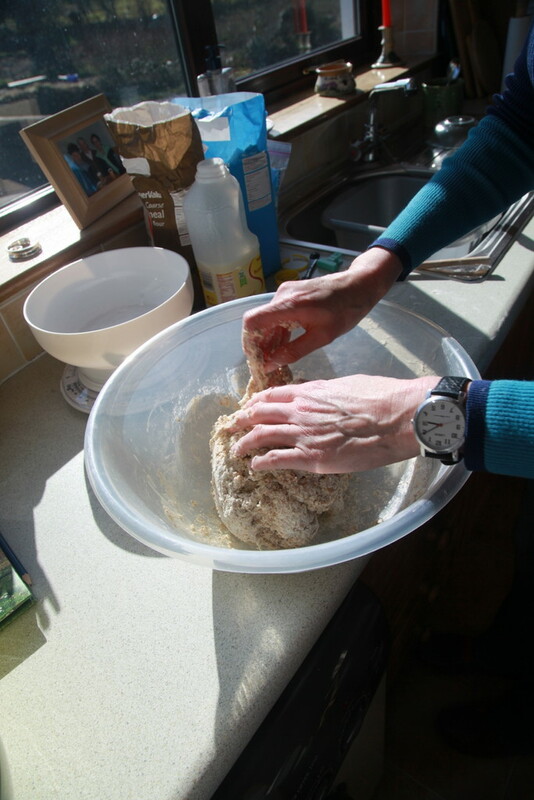 It does not need kneading or time to stand. 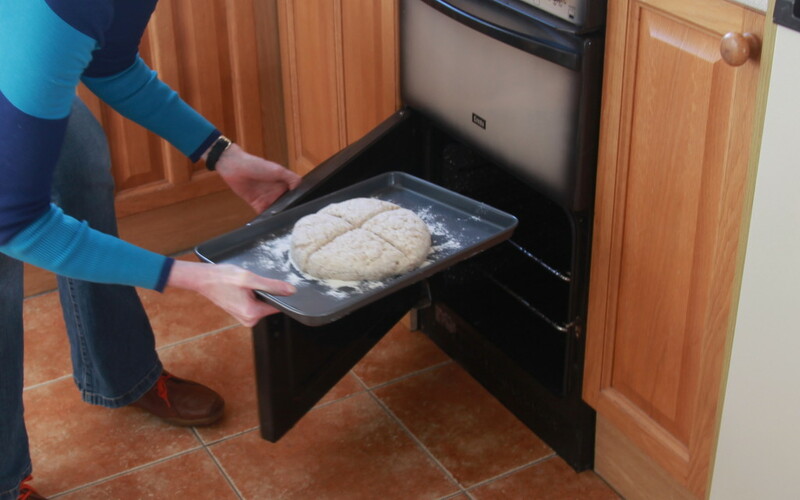 It has an Australian equivalent in Damper widely made in rural Australia and popular with indigenous Australians. 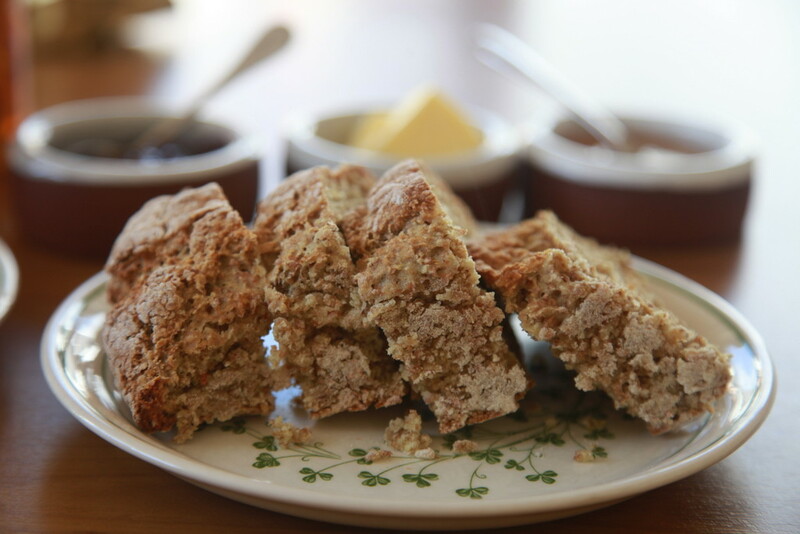 Here is Trish’s Recipe which she got from her mother and who knows how far back it goes beyond that. 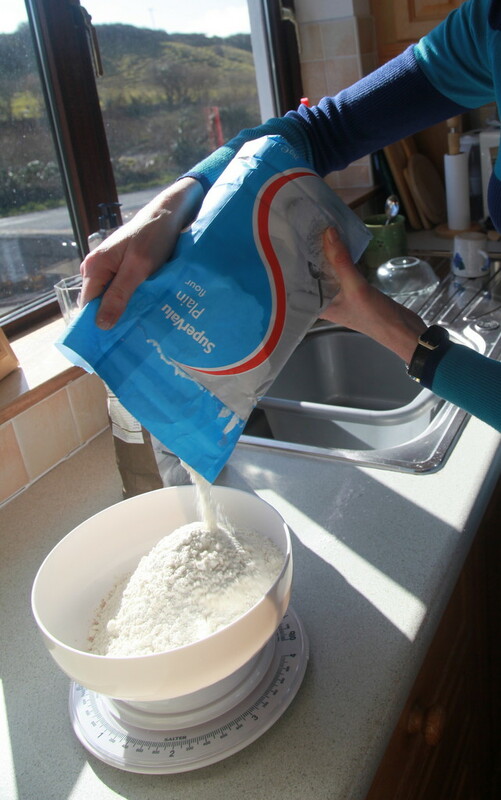 Trish’s recipe uses half and half white flour and wholemeal flour but it can be mixed in any proportion depending on taste. It’s very simple – here goes. 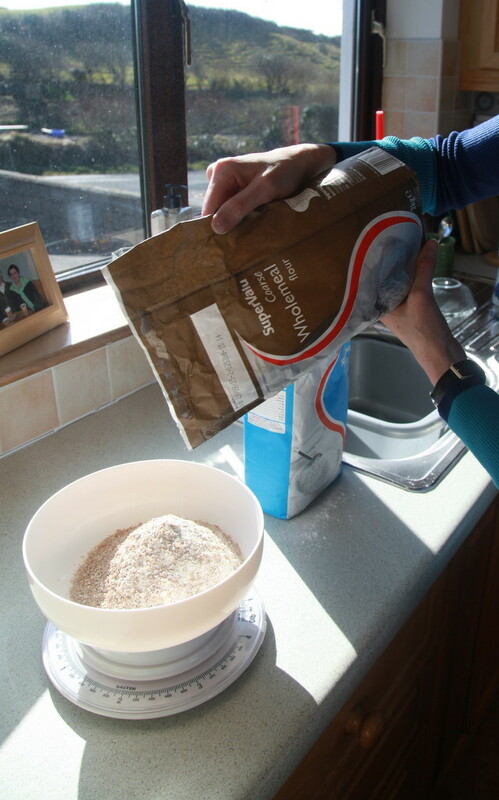 Take 20 ounces of mixed wholemeal and plain flour and add one heaped teaspoon of bread soda. Crush it between the fingers to break up the lumps. Mix. 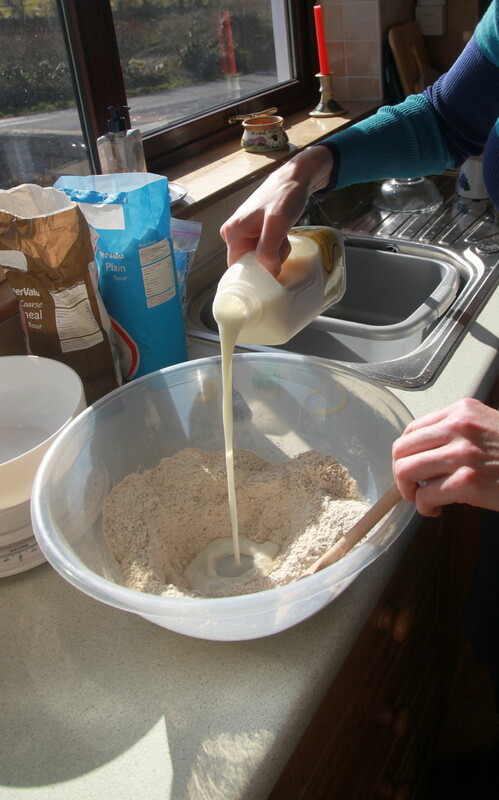 Add buttermilk, a little at a time, and lightly mix until consistent slightly sticky dough is attained. Salt is optional. 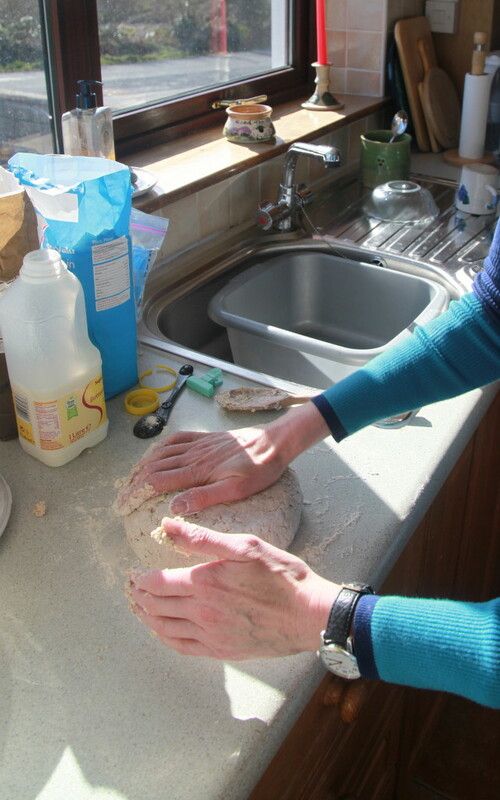 Make into a ball with a little flour on the bench and flatten into the desired shape and place on a floured baking tray. 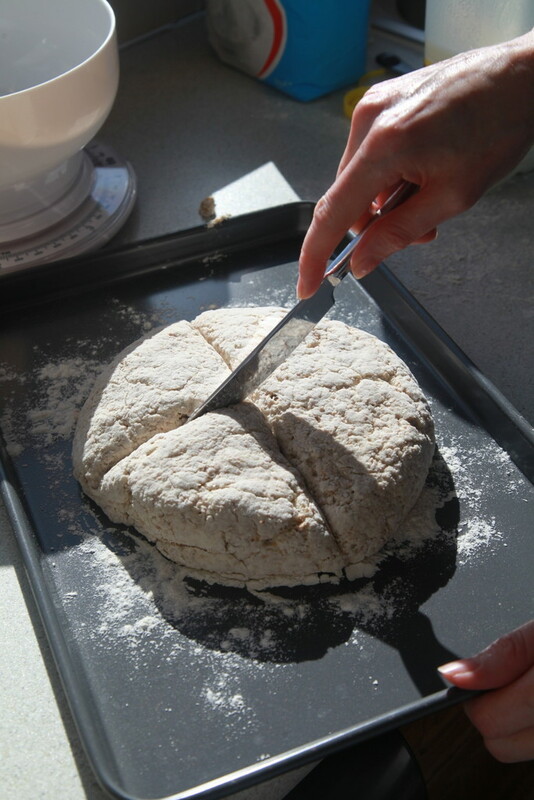 Make fairly deep cuts into quarters and place into a preheated oven at 200˚C for about 30-35 minutes. Check regularly in last five minutes. Tap bottom – a hollow sound means it is cooked! That’s it. The proof is in the pudding and it was delicious with Kerry butter and Irish Cheddar or spread with Clare jam (Strawberry and Baileys!). 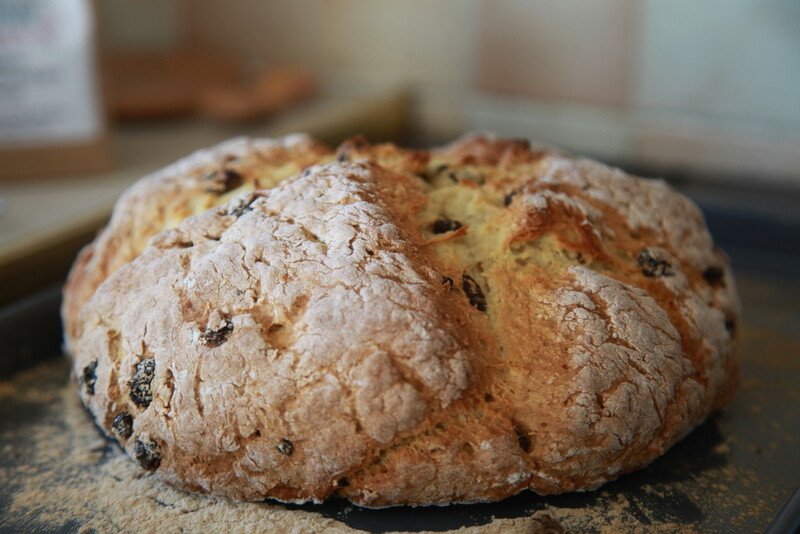 I had a go and mine was made with just white flour and with raisins (about 3-4 oz). Pretty proud of it – check the final photo. It’s in the freezer so yet to taste it. Thanks Trish for taking the time to open another window for me on the real Ireland. 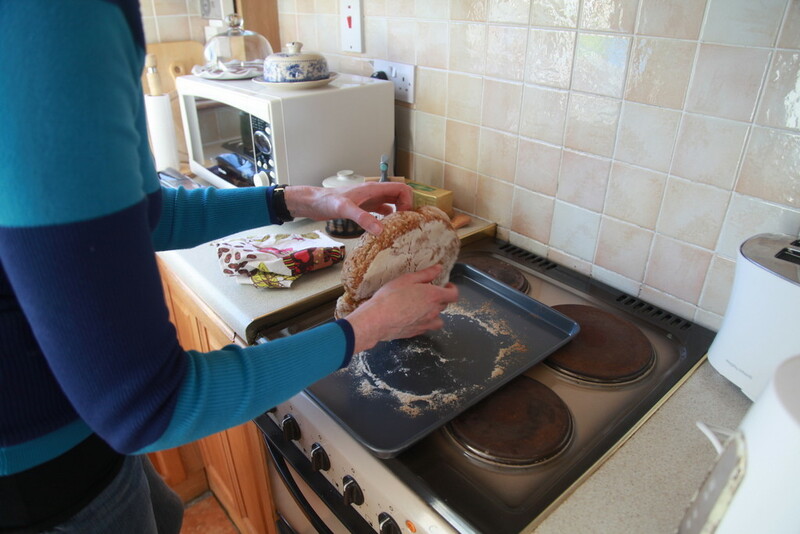 Give me half an hour’s notice if you’re coming to visit and I’ll have a hot loaf ready for you!